“Shazam!” isn’t as electric as it was said to be. In the comics, he’s famously known as “Captain Marvel.” New to the big screen, he steamrolls through several makeshift nicknames — “Thundercrack,” “Captain Sparklefingers,” “Red Cyclone.” But, the one quirky catchword that’s become his official moniker is the phrase he exclaims before transforming into the eye-popping, crimson-caped crusader: Shazam! (exclamation point included). 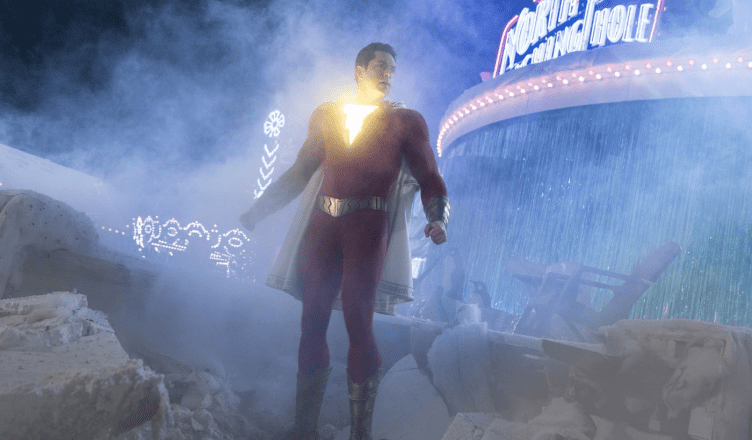 Like lightning piercing a gloomy sky, “Shazam!” is the bright and flashy feature among its grim and dark DC Extended Universe counterparts — and the only one with an excitable title. Distinguishing itself as a lighthearted comedy peppered with heartwarming, feel-good family ties, the hero flick is initially entertaining, but then it flounders in delivering anything refreshing. Behind the grueling business of every great hero comes a form of doting family that heartens the hero’s taxing and rigid lifestyle. The film emphasizes finding and accepting those who will support you, weaving in the sweet message that family can be built beyond bloodline. Growing up as a foster kid, Billy Batson migrated from household to household, leaving him wary and untrusting of filial love and commitment. Though his melancholic childhood makes for a brooding story, he turns out to be quite the mischief maker and good-natured protector upon meeting his new adoptive, Cheaper-By-the-Dozen-esque family. Under another roof, Billy meets his uniquely lovable (and surprisingly diverse) cast of step-siblings who are all foster children too. Out of five kids, the first to befriend a troubled Billy is blabbermouth and superhero aficionado, Freddie Freeman (Jack Dylan Grazer). His immediate bond with his new brother is a highlight of the film, as young Grazer seems to add a naturally witty rapport and giddiness to the characters’ fraternal relationship. Playing Shazam’s faithful sidekick, he slips into an effortlessly zippy dynamic, and retains an endearing chemistry with both the actors who play the electrically-charged super-human. Individually, Zachary Levi and Asher Angel epitomize the role of Billy Batson very well. Levi uses a frisky and goofy charm to capture a boyish spirit within a grown man’s body, while Angel embodies the tough and scrappy demeanor of a fourteen-year-old forced to mature at an early age. However, their different portrayals of this shared character is precisely why Shazam’s personality feels inconsistent. Because the film frequently ricochets between his mini and Herculean alter egos, the two versions’ dispositions become disconnected, and thus, it becomes difficult to ground the hero’s singular identity. Endowed to him by a magical predecessor, most of Billy Batson’s superpowers are the classics: superstrength, superspeed, super-flying, and other staple super-somethings. Of course, these abilities on cinematic display look polished and impressive, but they also seem repetitive and forgettable, lacking a spark of original action play. With the power to manipulate electricity and the fat insignia of a lightning bolt on his broad-chested costume, perhaps Shazam could have distinguished himself with a more hair-frizzing, finger-zapping, and thunderous potential. Rather, the action sequences contain unsightly, grimy CGI monsters that represent the Seven Deadly Sins. There’s no explanation to why these manifestations of Biblical villains are in close rivalry with Shazam’s antecedents, but they somehow land in the hands of the ultimate big-bad, Doctor Thaddeus (Mark Strong), to exploit and — in old-fashioned evil-doing — take over the world. Although he is introduced as quite the formidable megalomaniac with a traumatic backstory, his character is reduced into a laughable opponent. The movie automatically dismisses his bleak opening, which already seems out-of-place to the rest of the majorly sunny film. “Shazam!” is indeed a nice change from the usually grey and stoic DCEU atmosphere, and it does embrace a comfortable and jovial air that’s always a crowd-pleaser. Reminiscent of “Big,” “Shazam!” has saccharine coming-of-age elements and teen naivete — even mimicking the ‘88 film’s nominal 88 piano keys scene — that other superhero films don’t normally have. However, it simultaneously feels like it wants to be a wacky, over-the-top “Superman” parody, not knowing how to pull it off. So, instead, the movie lingers on a safe, routine narrative route with fight encounters that batters in several rehashed, “self-aware” jokes. We’ve seen these formulaic comic tropes appear in almost every superhero blockbuster that attempts to be “funny” and “offbeat,” and the schtick is starting to get old now. Although “Shazam!” is average in its superhero telling, it has a simplicity and sentimentality of finding strength within and surrendering yourself to those who want to unconditionally help. Yes, there are cracks in the narrative, such as the surface-leveled thematic depth, extremely broad humor, and disappointing villains. But, alas, it’s just another fun, punch-bad-guys-to-win superhero story, one that we the audience can mindlessly munch popcorn to or watch attentively, gaining the same experience either way. Perfectly sums up another movie with a review well written and agreeable. Big fan of this author as someone who isn’t afraid to score movies lower when they deserve it. Can’t wait to read more!